If you have an idea of how the fish perceives its environment, then on the one hand you are some way towards knowing how to offer your bait to it in a way that it will find irresistible, while on the other you should also be able to deceive it about your presence on the river bank in the first place! Put these two together and the benefit that understanding a little about the sense organs of fish can bring to the angler becomes pretty clear. Fish share many of their senses with humans; their eyes generally see colour at least as well as we do, they have a well developed ability to smell or taste the water around them and they are sensitive to touch. Other of their senses are entirely their own – including the lateral line and the electric-sensing abilities of sharks, catfish, some rays and eels. As a result, compared with us, the way they view their watery environment is a mixture of the familiar with the radically different. Most fish have well developed eyes, which have a structure very similar to our own, although the cornea is flatter and the lens more spherical – both of which are adaptations to seeing in water. The size of the eyes is widely accepted to be an indication of the fish’s reliance on vision, with fast swimming daytime predatory fish such as pike, trout and perch having relatively large eyes, while nocturnal species like eels, catfish and barbel have smaller ones. 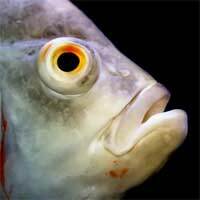 In fish which hunt by sight, the two optic lobes of their midbrains are also particularly large to help them process the information from the eyes quickly. Pike are credited with the sharpest eyes of the freshwater world – which is reflected in their amazing ability to spot camouflaged prey in cloudy, weed-infested rivers. Although fish possess fully formed hearing organs, there has been much debate over the years about how well they actually work, although most people now agree that they do hear something. However, it’s probably fair to say that they don’t hear particularly well – or very much. The uniquely fishy lateral line is, by contrast, widely known to be a remarkably effective organ, helping fish to avoid collisions, sense currents and movement in the water around it and even locate prey. Some scientific studies with shoals of sea fish – principally pollock – have also established that the lateral line plays an important part in helping fish to school. The lateral line itself is composed of a narrow, skin-lined corridor lying along the flanks of the fish, connected by short mucus-filled tracts to the surface of its body, and interestingly it is not exactly the same in all kinds of fish. The lateral line of the bitterling, for example, is particularly short, while that of the pike extends well into its head – leading to speculation that the usefulness of the organ may vary from species to species. The linked senses of smell and taste seem to allow fish to discriminate between different foodstuffs and laboratory experiments have shown they can accurately distinguish sweet from bitter. From a practical point of view, this ability is exploited by anglers when making up bread paste baits with different flavourings, especially for bream, carp, roach and rudd fishing. Aside of helping fish find and choose their food, smell and taste seems to be an important help to some migratory species – particularly salmon – in locating their ancestral spawning waters. When you consider the array of sense organs that even the humblest of fish has to call upon, it’s easy to understand why all the age-old wisdom about making the bait or lure “look” right, not getting human scent all over your hooks and not being too heavy footed on the river-bank, has stood the test of time. By the same token, it’s also becomes pretty clear why catching fish can pose such a challenge!